Are you just starting off as a work-at-home professional? Or maybe your current home office is feeling a little bit underwhelming and whole lot understocked? There are 7 things every home office needs to be a successful workspace. With the right tools on hand, your workflow becomes more efficient and you become more productive. No matter what business you’re in, a good computer is essential for everything from bookkeeping to advertising. While desktops tend to be more powerful and have more memory, laptops have the upper hand on portability and versatility. Weigh your options carefully and think about where you use your computer the most. Depending on your circumstances and the amount of traveling you do, you may need both a laptop and a desktop computer to effectively run your business. A good, wireless printer is essential for any home office. Do your research on ink costs and product durability before purchasing. Opt for one that can be connected to your home’s Wi-Fi network, so that you can print from anywhere. This is especially helpful for small spaces where getting creative with storage is key. Even if you do most of your planning and scheduling on an app or online, make sure you have a wall or desk calendar handy. It’s important to be able to glance at the date while you’re on a call without having to scroll through apps or wait for your Google calendar to connect. A desk or worktop is a must-have given, but getting the right size is key to productivity and efficiency. If you like to spread papers out or need space to look at multiple books or proposals at once, be sure that your desk can accommodate that. There’s nothing worse than a worktop that’s too small for your needs. Think outside of the box if you need to, because sometimes, an inexpensive, rectangular dining table makes the best unconventional desk of all! Flooding your work area with the right lighting goes a long way toward increasing productivity. Natural light can help brighten the space (and your mood! ), but you need more than that. A small desk lamp to illuminate your work and overhead lights that brighten the room are a great start. Be mindful of computer screen glare and position your desk and monitor to minimize the amount of shadow that falls across this space. Having a bright, well-lit workspace can increase motivation and productivity by leaps and bounds. Finding the right office chair can mean the difference between dreading your office and loving it. Choose function and comfort over style. Take your time selecting a chair and always try before you buy. An uncomfortable desk chair can lead to lower back problems and one that doesn’t adjust to the right height can leave you working at an unusual angle. A small filing cabinet or file box is essential for keeping your home office organized. Without it, when important papers and receipts start to pile up, you’ll find yourself with a cluttered, unproductive space. Eliminate clutter by filing papers as soon as possible. A clean workspace is a productive workspace! Setting up your home office doesn’t have to cost a fortune, but investing in quality pieces that will withstand daily use is key. When your office is stocked with the supplies you need, you’ll find that you’re able to get more done. Whether your home office is tucked under the stairwell in the basement or has a room of its own, with the right pieces, it can be the most productive spot in the house! 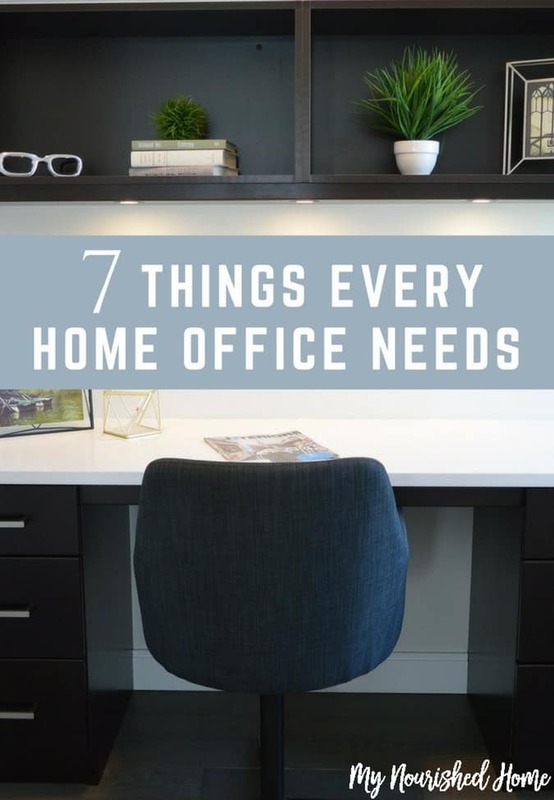 Do you have these 7 things that every home office needs? 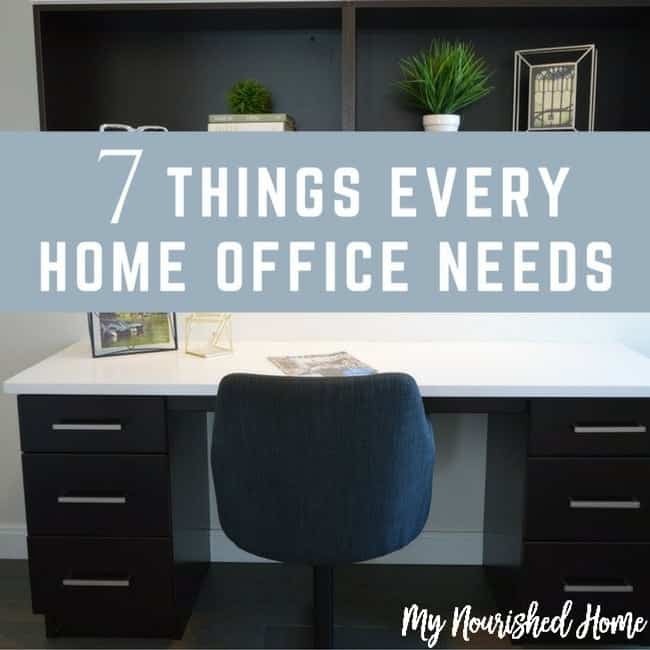 Or do you have additional items that you can’t live without in your home office? Need More Home Office Ideas? 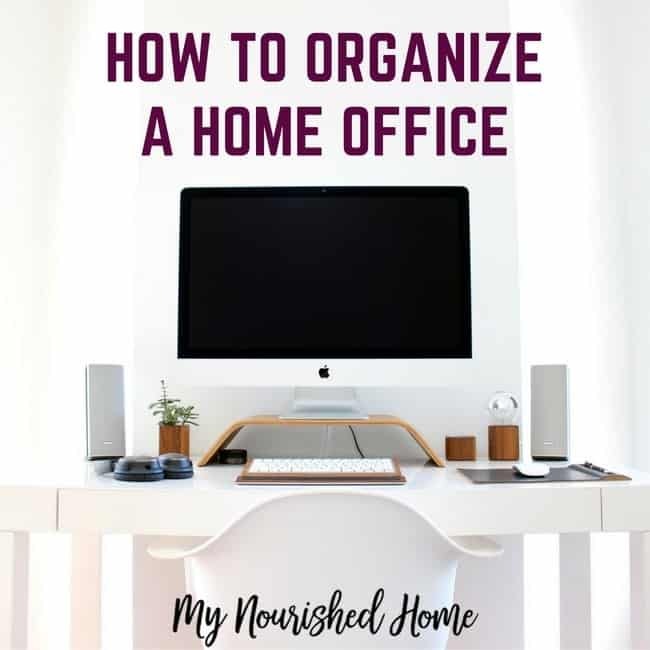 I am all about keeping your home office organized and prepped for a successful day. Check out these tips for home office organization!